The new flytouch 3 Froyo X220 512MB RAM 4GB HDD SuperPad. This is the latest release with the more responsive touch screen. This tablet has high definition LCD Touch Screen with HDMI, 2 x USB, 1 X Micro SD and built in Ethernet inputs. Some other features include real android 2.2 with fully functional Android Market, front facing camera/webcam, GPS, and G-Sensors. The build quality is extremely high and the unit is very smooth thanks to the 1 GHz processor. 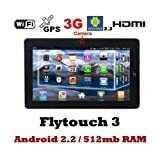 This Flytouch 3 Froyo X220 1GHz Android 2.2 512MB RAM 4GB HDD Flash 10.1 Tablet features a 10.2 inch touch screen interface allowing you to watch movies, play games, and listen to music, view documents and surf the web on the go. Using the Google Android OS it is capable of accessing the internet and playing high definition 1080P video at lighting fast speeds. With its self-contained and compact design (only 15 mm in thickness), this slick design, mobile internet device allows you to take both your work and play with you wherever you go. The Flytouch 3 10.2 Froyo X220 1GHz 512MB RAM 4GB HDD packs a powerful 1Ghz processor (Froyo which is much faster than Rockchip and Telechip), 512MB RAM, Nandflash drive 4GB (You can add up to 32GB of Memory), 3G USB modem support and Wifi 802.11b/g capability. Supported video playback formats include 1080P DIVX AVI, MPEG, RM and more. Supported audio formats include MP3, AAC, WMAs and a number of others. It is also compatible with word, excel, PowerPoint and pdf documents. 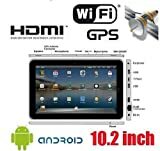 This magnificent 10.2 inch Android Superpad keeps you connected and entertained everywhere you go! The touch screen Superpad Google Android comes with a built in webcam for video chat. This magnificent 10.2 inch Android Superpad keeps you connected and entertained everywhere you go! The touch screen Superpad Google Android comes with a built in webcam for video chat, Wifi, and numerous cable ports, including two micro SD slots which support up to 32GB (16gb per slot, sold separately), two USB sockets (for key board/mouse/USB flash disk), an audio jack, one HDMI socket, one RJ45 socket (Ethernet) for super-fast wired internet connection. It includes a built in GPS chip, which allows the Superpad to be used as a GPS device. Maps can be purchased online and downloaded to the Superpad, making it a superb 10.2" navigator! Along with touch screen, it comes with a digital pen that can be used for drawing or note taking. The Android 2.1 software delivers multi touch capabilities and access to watching videos, playing games, and browsing the web.